In light of the recent downturn in the American economy, the nation’s jazz musicians have joined the long line of lobby groups looking to Washington for support as the economy slides into a deepening recession. The jazz industry is asking Washington for a bailout package and major subsidies on par with that of the auto sector. As such, jazz musicians also want access to credit and tax breaks to stimulate investment and help the development of new recording and performance opportunities. “This recession has really got me dragged, ya dig?” says Luther Hip Bones Jones III, a New York City saxophonist and a cornerstone of the little known Wall Street Avant-Garde jazz scene. Similarly, Jones associate Willie Fat Cheeks Hughes comments that with the economy in near chaos, the demand for his jazz bagpipe skills has waned considerably. Hughes also comments that with a sluggish economic situation, he will soon have to find another girlfriend or else face certain homelessness. While this crisis has been brewing for some time, a recent spike in the number of trombonists delivering pizzas in New Yorks Greenwich Village has recently brought this dire situation to the publics attention. 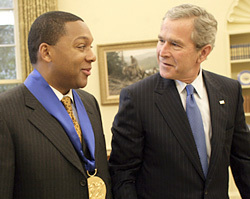 Last week, however, jazz advocate Wynton Marsalis met with President George W. Bush and the White House economic team to discuss the worsening situation for America’s jazz artists and a possible stimulus package. Bush also commented that a global consensus on the state of the jazz economy will have to be reached. The way things stand, America’s jazz artists just can’t compete with the lower paid jazz artists currently flooding the market from China. In related news: America’s Blues musicians report an increase in depressing lyrics. “[It] indicates a reflection of the times.” claims one downtrodden guitarist whose wife recently left him and whose dog has died.